FYI: Recorded live at Regent University Theatre, Offering of Worship returns to the singable songs of simple faith, praise and worship that are the hallmark of Baloche's creations. Having served as producer on several projects for Maranatha Music's Praise Band, of which he is also a longtime member, Paul was at the helm of recording for Offering of Worship as well. 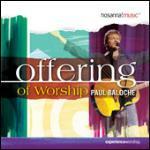 The Bottom Line: While the music of Paul Baloche will certainly make its way into hymnals as it has already into the hearts of the church, he is not afraid to pay tribute to those who have prepared the way for his own journey. Beautifully combined, Baloche's arrangement of the classic hymn "Fairest Lord Jesus" blends seamlessly with his own words in "My Only Crown." The result, like the rest of Offering of Worship, is a testament to his place as one of the foremost worship leaders of his time. Featuring: "Arise," "All the Earth Will Sing Your Praises," "Without You," "Offering," "Arms Open Wide," "My Reward," "Taste and See," "All Praise and Honor," "Fairest Lord Jesus/My Only Crown," "You Prepare a Table," "You Are the One" and "All for You." Special Offer! Order the CD, Songbook, and Trax today. Plus, save up to $6 on specially priced sets—add Paul's live albums God of Wonders and First Love featuring over 25 more worship songs!